Over the past three years, Jackie and I have done a lot of walks where the distance came in at around 20 miles, but we’d never actually reached 26.2. Yesterday we did. In many ways, this was just another training walk for our planned Kal-Haven trail walk—which is why we hadn’t hit this distance before: We’re much more concerned with not hurting ourselves before the big walk than we are with hitting any arbitrary distance in advance. Me in my marathon rain jacket. Photo by Jackie Brewer. 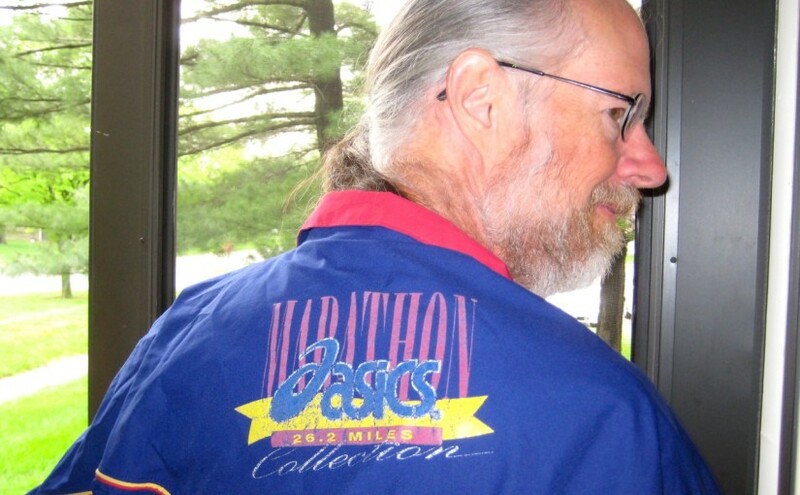 I got this jacket long ago—at least 15 years ago, maybe longer. I remember finding a gore tex rain jacket in the Sierra Trading Post catalog at about an 80% discount. I think it was so cheap mostly because it doesn’t have a hood, which is a deficiency for a rain jacket, but the large marathon graphic on the back may also have put off some people who were not marathoners. 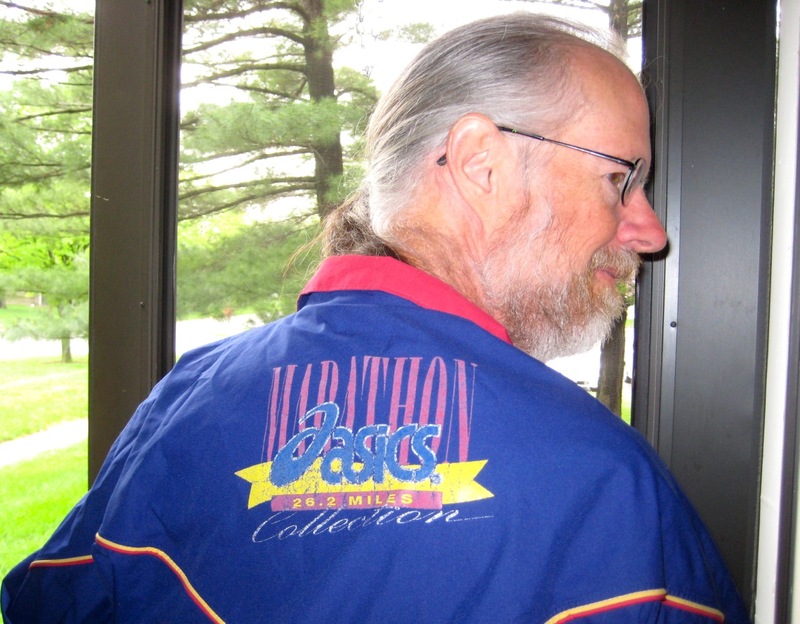 All these years it has been my main rain jacket, and all that time I’ve been just a little uncomfortable wearing a jacket so prominently marked as being for marathoners. Now, finally, I can quit worrying about it. It was a great walk, although we were feeling pretty tired the last few miles. We went up to our old neighborhood and walked around our old apartment complex. (It looks a bit more empty than when we were there.) We walked up the Greenbelt Bikeway, then headed east to our summer place. (It looks exactly the same as it did when we lived there last year.) Then we walked through the water amenities at Second Street, and onward to Busey Woods. Then down Race Street to Orchard Downs and across through the arboretum and the research park. We went north to Florida to cross the railroad tracks, then headed south along the Boulware Trail and on into Savoy. We went west just a bit to take the path along Prospect down to Curtis and thence to home, taking a slightly long route through Winfield Village (with a tiny diversion into our prairie) to be sure we hit the target mileage. A couple of days ago, I was updating my running log and noticed that my cumulative distance for the month so far was 26.2 miles. I tweeted it, mentioning that my cumulative time spent running that distance was 5:02:53, but my twitter followers are mostly not runners, and I don’t think any of them realized that, to a runner, 26.2 miles is a round number—the distance of the modern marathon. It’s good for me to see that my short runs do accumulate to some significant miles. It’s been three weeks since I upped my long run to 3 miles, and I’ve started to get pretty anxious to stretch it out to 4 miles. But I once before pushed up my long runs a little too quickly at just about this point (so I could run in a 5.5 mile trail race), and in the process hurt my Achilles tendon—an injury that took more than 6 months to heal. Any little thing to motivate me to keep running the same distance until I’m ready to handle longer distances is good. I am still boosting my overall distance, I’m just doing so very slowly. My weekly mileage for the last three weeks was 8.5, 8.8, and 8.9 miles. I’ve done 6.1 miles already this week, and will probably crack 9 miles (although I might not, because the forecast high for Thursday is 102℉, and I may just take a rest day). Longer long runs will come. Just not quite yet. Several miles of the Illinois Marathon course run quite close to our apartment, so I thought I’d wander over and watch some of the elite runners go by. 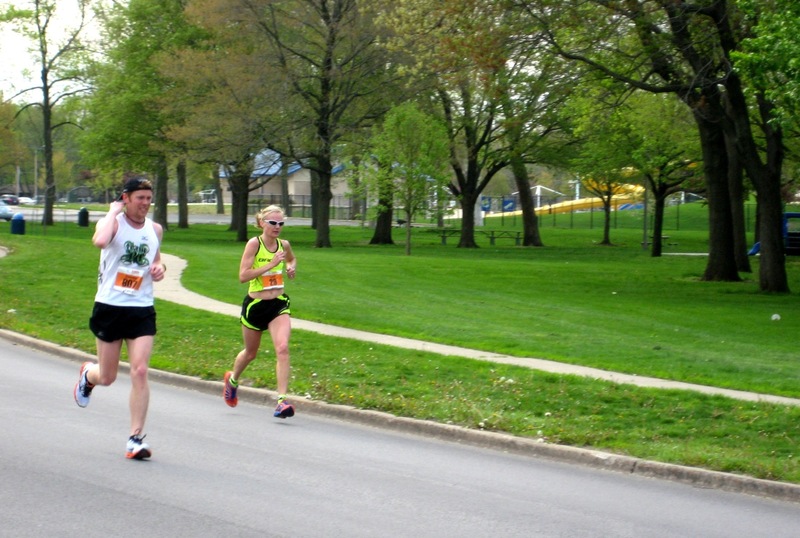 The people who win a marathon run at about a 5-minute-mile pace. So, with the nearest point along the course being roughly mile 18, I figured they’d come past about an hour and a half after the start. My figuring was just about right, but I was a little slow getting out of the house, so the first two runners went by while we were still a block away. We got to see the rest of the top men go by. They were pretty spread out—it doesn’t look like this is going to be a tactical race at all. It was a grey, cool day. A bit windy for anyone hoping to get a great time, but otherwise perfect for running a marathon. It was, however, just a bit chilly for standing still. We watched runners go by in ones and twos until we saw the first of the women go by, then headed back home.